eNLokam: China plans to build Space Station! China is going it alone. It has announced plans to build its very own crewed space laboratory by 2020. 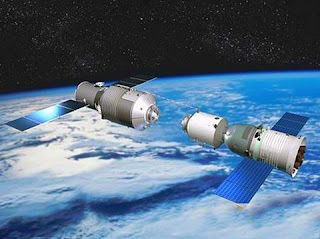 China, meanwhile, has been expanding its space capabilities, and, on 27 October 2010, officially launched a project to develop a space station by 2020. The station will have research applications, including studying living conditions for astronauts. The Xinhua news agency revealed these. China's steady investments in human space flight "make it very clear they are going to be in space in terms of a human presence and are going to be there for a long time", says a US expert. China plans to launch two or three space laboratories (target vehicles) and with several spaceships docking between 2011 and 2015. Around 2020, China will launch its core module and science laboratory module when it will begin the construction of a space station. Gu Yidong, chief commander and designer of China's Manned Space flight engineering applications introduced that with conditions capable of supporting space science tasks and resource support, the space station can provide conditions for taikonauts(Chinese equivalent for astranauts) to carry out space tasks in the capsule and on the platform outside. Therefore, the taikonauts can conduct science experiments including the tasks of operation, construction as well as maintenance in and out of the space station. After launching into the space, a cargo space shuttle will annually transport supplies to the space station. No doubt, China is making news...worth hearing as well.